Woodward sings the praises of his native state, from the mountains to the “heart-stopping emptiness” (210), and his informal writing style puts the reader at ease. Glimpses into his personal life frequently result in humorous episodes. Woodward writes: “Humor columnists fall victim to the most unlikely mishaps. We pitch our tents on red-ant hills, our dogs lock us out of our cars, we find an ocean of trouble in a thimbleful of paint. The world seems to conspire against us.” (1). Some of his misadventures include a crazy monkey, a car alarm that will not stop, a trip to “Idaho’s Siberia,” and a set of flight changes that seemingly never end. Fortunately, he documents these calamities, inviting smiles and recollections of similarly unforgettable moments. Several articles provide poignant insight into Woodward’s life as he encounters an empty nest, growing children, or losing friends and family. One such article tells about his brother-in-law’s passing after a long and painful medical condition, while another describes the life of an 83-year-old woman living alone on an old ranch, not far from Hells Canyon. Woodward succeeds in bringing these individuals to life, supporting his overarching theme that Idaho and its people really are gems in the mountains. Large portions of the book focus on life in Southwestern Idaho, but certain vignettes cast nets over other Idaho regions as well. Woodward claims that the number of articles and columns selected for this book “represent less than one percent of [his] career output” (vii). Still, he manages to include articles about J.R. Simplot, Lynn Redgrave, Morley Nelson, an Idaho brand inspector, a peacock woman, a Salmon River caveman, and a long list of others. 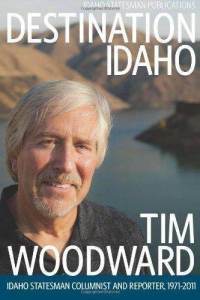 Woodward has written several books incorporating his newspaper columns as well as one of the first biographies of Idaho’s acclaimed novelist Vardis Fisher, Tiger on the Road. If you like well-written stories, Idaho, unique characters, beautiful places, and humor, then Woodward’s Destination Idaho will not disappoint. This book is recommended for all public libraries in Idaho and for academic libraries collecting works by Idaho authors. Spencer Jardine is Coordinator of Instruction at Idaho State University’s Eli M. Oboler Library.